Delegates who attended the seminar had the opportunity to enjoy a feast of delightful martial arts principles cooked slowly and presented beautifully with thorough attention to the content and the packaging. 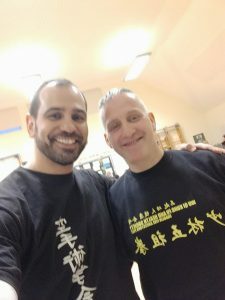 When I first met shidoin David in Ireland in 2016 I connected immediately with him and two things were clear to me from the get go: he’s a top man and a top martial artist. However, I confess that, whilst I knew and felt the excellent person he is, his martial arts knowledge, execution skills and coaching abilities have truly awe me this weekend. He is not good; he is outstanding! What I witnessed and experienced this weekend was, by any standard, a master class in biomechanics unravelling the core principles of martial arts, in general, and Koryu Uchinadi, in particular. Sensei David’s pedigree is impressive and his martial art exposure and experiences across a wide range of martial arts is second to none. A true scholar of functional and pragmatic martial arts with very solid scientific background throughout. What else can one wish for? The sessions were superbly structured, beautifully connected from the warm-up to the advanced flowing exercises; and core principles were well covered to ensure the structure of KU starts resting on solid foundations. •	Sensei David’s student, Manuel, is an outstanding KU-ka in his own right and he did an amazing job in the demonstrations and coaching the group. •	Sensei David is an impressive coach. I’ve always said that if you want to measure the quality of an instructor, look at his students. •	Boy, these guys train *HARD*!!! This seminar was not one of those one-off experiences which is nice to have, but then you go back to carry on doing what you are comfortable with. There were pearls and details that can and will adjust KJG direction of travel, which is something only a few have achieved: Hanshi McCarthy, Kyoshi Paul Enfield and, now, Shidoin David Fernandez. Delegates were double blessed because senior KU representatives also joined us, Joost Frehe and Andrzej Kazmierczak, as well as two wonderful yudanshas, Edina Imrik and Alan Richardson, making the whole experience so wonderful. As Hanshi has shared on Facebook many times, “True leaders don’t make followers, make new leaders”. Well, there’s an amazing future in KU if we go by the calibre of the likes of shidoin David. Another testimonial of the IRKRS and Hanshi Patrick McCarthy. In name of the KJG, thank you very much and hasta pronto, amigo! Article written by Andy Lovegrove 2nd kyu, a true scholar: teacher, education consultant, musician, pianist and a wonderful karateka. A true man of budo! Sensei Fernando M. Angulo (of Surrey Karate Academy) had the great pleasure to host and welcome an Internationally Renowned Karate Ka Celebrity, Sensei Paul Enfield, 8th Dan (just arrived from California) at the Riverbourne Health Club, in Chertsey, Surrey on Sunday 09.09.18 for a one off Karate Master Class Session. It was an unexpected opportunity and one not to be missed! We were delighted that 16 karate kas could attend this Master Class at short notice. There were also several observers present in the Master Class Dojo at Riverbourne. Sensei Paul Enfield presented a highly intellectual three hour Karate Master Class with a viva voce question and answer section during the interval. The karate landscape coverage content was functional, meaningful and purposeful rather than any stylized approach to karate as seen in mainstream sports karate. Sensei Enfield spoke about a karate ka’s technique can be irrelevant without getting the position of your adversary in the right place. Create the opportunities in order to apply your technique with the right position and angle. It was also about absorbing (receiving) and transforming the energy in a series of paired partner practical “Connector Drills” to work on the flow, and thus feel the opposite energy of your partner to create an opportunity and apply a technique. Karate kas had to imagine real life scenarios (in the master class workshop) and that meant taking your opponent’s space by stepping into it with the feeling of contraction and expansion, and knowing how energy works by displacement of body structure. Sensei Enfield had in effect painted a full canvas of a karate ka’s biomechanic technology in a karate landscape of real life situ with thick oils for us to go away and think about, to further develop our neural pathways. This was so evocative of our late, early nineteenth century English Romantic Landscape Painter, John Constable, being one of the first landscape artists in a time where landscapes were then regarded as a lower form of art than history or genre paintings. Though Constable knew then that his landscapes were real and functional and purposeful, just like our Karate Master Class Workshop! John Constable said, “Painting is but another word for feeling”, and Sensei Paul Enfield certainly demonstrated what is meant by a karate ka’s state of feeling with his flash lightening “Ju Go Ju” (Soft Hard Soft) approach. It was a real pleasure to attend this Karate Master Class, for each karate ka delegate only had to lift up their eyes to see a whole karate cinema of kaleidoscopic mirrors and rotating coloured pieces of glass! Our sincere and grateful thanks are extended to Sensei Fernando M. Angulo (and Brad Candy) for initiating and organising this Master Class at such short notice. Fernando Angulo was indeed our most fortunate circumstance! The subject of kata is one that fascinates me. There’s enough evidence suggesting that back in the days pre WWII kata training in Okinawa followed a very bespoked approach where karatekas often studied different katas, suited to their specific build, physical condition, skills, etc. Even the execution of the kata wasn’t expected to be a clone to that of their peers or senseis. It’s only when karate attracted a wider audience and numbers grew that standardisation of kata was introduced and large groups of karatekas started studing the same katas and followed very strict execution guidelines. Standardisation went yet another level up with the introduction of kata competions, where karatekas had to be assessed against common and agreed set of rules, often introduced or changed for aesthetic reasons. Where does standardisation leave the essence of kata? What was kata for originally? Where could I start? How much can one extract from a 3h workshop in order to make a fair assessment? The following are my observations, thoughts and opinions on the experience I had in the seminar and is not an analysis of any kind. I have been practicing different styles of karate for some 26 years. I had a spell in Aikido for just under 2 years and I’m currently studying a little ju-jutsu and koryu uchinadi (KU). My experience, it’s safe to say, has been within the realms of Okinawan and Japanese martial arts. I’m fully aware of the strong ties between karate and Chinese martial arts, which I won’t be discussing on his post. These ties, however, have develop an ever-growing interest on Chinese martial arts, especially Wing Chun, White Crane, Wu Shu and Five Ancestors. I also must admit that my understanding of Chinese martial arts is very limited in both, its history and classification, which is something I’m working on. The seminar I attended yesterday was organised by sensei Phil Aucott and delivered by Sifu Matthew Scott, who was assisted by many of his students, especially Kristian Clark. I must say at this point, before I share anything else, that everyone was so warm and welcoming. A true exchange of knowledge and fellowship between martial artists. Sifu is very soft-spoken and there’s something very soothing and calming in his mannerism. Visually, one can tell he’s a very strong man, but impossible to understand the degree of his strength until you pair up with him for some pushing hands techniques. It was at this very moment I felt ‘something‘ very different to anything I’ve felt before. The exercise consisted on pushing or pulling each other with extreme softness by properly rooting down. Now, rooting is a fundamental concept in karate, and so is softness, especially within those styles that share a common naha-te lineage. Goju in fact, means hard-soft and it is known that Chojun Miyagi, founder of Goju-Ryu, chose this name from within a poem of the Bubishi. Again, the historical background is out of the scope of this post and nothing I can say will surpass the research Hanshi Patrick McCarthy captured in his master piece, Bible of Karate Bubishi (1995) and Bubishi: The Classic Manual of Combat (2016). Rooting is something I have achieved to execute with a fair degree of proficiency by studying and training with a devil-like attention to detail on correct bio-mechanics. In fact, throughout my karate life I have been obsessed, so to speak, with applying the optimum bio-mechanics that enables me the most effective and efficient execution of a technique. Thus, applying my body conditioning by using the right muscles in the right way has delivered very good results in the past and yet, here I was, paired up with Sifu, working on this soft pushing hands drill and not only I couldn’t move Sifu an inch, I was lifted and sank with such ease I just couldn’t understand. There was something else going on here! I tuned and sharpened all my sensory acuity senses and focused my visual, auditory and kinesthetic (VAK) system to identify the source of this energy. “Can we do this again”– I asked. Same result. “Let’s do this again” – I said. Again, same result. “Hang on, let’s do this one more time. I want to check your footwork” – I begged. Again, lifted like a feather off balance. I was in dismay: all my bio-mechanic expertise wasn’t enough. Not anywhere close. Sifu’s smile was anything but patronising. In fact, there was nothing patronising whatsoever on this session. Just many martial artist working together. It was very simple: Sifu had an understanding of something that I did not, Chi. This inner energy has many terms: Chi, Ki, Qi, Prana, to name a few. The reader can chose to stop reading this post and promise I won’t feel offended. Many martial artist disregard this inner energy that flows within us; many simply discredit it and or believe it is some kind of Chinese folkloric mysticism. There’s a lot of rubbish and charlatans out there, I know, which hasn’t helped. Here is where everything is a little bit blurry and I will try to explain the best I can, whilst is fresh in my mind. Sifu explained he wasn’t rooting with his feet nor dropping the body weight, but with the tanden, using his breathing. This led us to a profound conversation the interconnection of Man, Heaven and Earth and how the energy flows free (or not) across these three Principles. Again, Chinese folklore or a dimension of the human being we have failed to study and develop in the Western world? You decide! Sifu explained he could listen my intentions with such ease he was lifting me or dropping me inside the hole (the void) every time I attempt to use my highly trained bio-mechanics. It was just hopeless. “You are soft and relax” – Sifu explained. “But to me you are hard and tense. It’s all relative” – He continued. First, as a karate instructor I am always asking my students to relax and find their softness in order to to express their karate with more inner power; and now I found myself on the receiving end of such message. There’s always another level to go! Secondly, my frustration to understand how to relax in the way Sifu was explaining made me reflect again. Do my students feel equally frustrated when I ask them to relax (which is obvious to me they are not) because they don’t even know what I mean or how? This experience made me grow as both, a martial artist student and coach. I must share something that captured my attention and this is the fact that Sifu referred to feeling kinesthetically as to “reading” which was then corrected to “listening” and, on reflection, this synesthetic choice of word (reading is a visual experience and listening is an auditory one) makes me think: does working on the mastery of the chi unite the VAK senses to become one? The Visual, auditory and kinaesthestic senses all become one harmonised experience? “Ok, so how do you train the rooting, the softness and the chi” – I asked. “San Zhan” – was the answer. “Everything starts and finish with San zhan and this must be practised many, many times daily” – Sifu continued. We spent a fair amount of time working on the form and then testing it with pulling and pushing techniques. Very much like shime applied to our sanchin form, however the ethos and method in testing couldn’t be any more different. At this point, I was paired up with Kristian, a very warm and welcoming student of Sifu. This experience was extremely insightful because I could feel within Kristian a strength that defied my own strength as well as my bio-mechanic skills. The softness of his moves were of such hardness I had to apply my 150% to just be in the game, so to speak. Kristian, in an act of wonderful humbleness, confessed he also also had to apply himself as he felt he resorted to physical strength in order to compensate mine and I had put him to test in using the rooting of the tanden and the chi. After this exercise, Kristian thanked me “for helping him”(!). When we finished, we all gathered in circle and Sifu spoke to us for some 15 minutes. The conversation was deep in many layers, capturing many concepts which deserve a blog of their own, but to name a few we spoke about the importance of the transition from one state to another. We give way too much importance to the static stance and technique, but it is the “nothingness” between the flowing transition that matters. Sifu also reminded us that “To perform san zhan with mastery, you have to become san zhan”. I absolutely get this, I really do. This led us to discuss how we must behave as vessels and how we must empty it when it’s full, prior to putting anything else in. This was within the context of attacks (giving) and blocks (receiving). Not an easy concept to grasp. Sifu demonstrated some moves as Kristian was asked to attack with a punch and Sifu’s moves were of extreme sharpness and power and, I’m sorry for the cliche, moved like flowing water. And the importance of how to apply this in the execution of our moves. I could carry on, but I’m confident this captures the experience with enough detail for the reader to get an idea of what it felt like to experience san zhan for the first time. My preliminary conclusion is that, on a personal level, I’ve worked my mind and my body with especial attention to bio-mechanics for many years, however I have not worked in a way that has helped me to develop or channel my Chi (or Ki). This is something I must address next. My second preliminary conclusion is that most karate styles have been reduced to impact technology (kicking and striking) and this is especially true in sport karate. This reduces any opportunity to engage your hands with your opponent and the irony of the matter is that kumite means “entangled hands” in the first place. At SKA and KJG we train our grappling technology as well as practice regularly tegumi, but we do so with attention to body conditioning and bio-mechanics. We must find a way to introduce exercises on ki and tanden rooting if we are to become a well-rounded martial artist. My third and final preliminary conclusion (for now) is that to achieve this level of mastery one has to train in a way that it becomes a lifestyle. In fact, you no longer “train” as if that was some kind of external activity that you add to your life whatever number of days a week; it actually becomes an intrinsic part of how you live your life and who you are. 1. Identify five major Goju-Ryu lineages after Miyagi and their respective founders. Some of Miyagi’s key students branched in different directions. 2. What does the last karate precept of Funakoshi’s ‘20 Commandments‘ mean to you? What this means to an individual is very personal, but I very much like the idea of making karate an intrinsic way of living my life in and out the dojo, as well as keeping a creative mindset with karate. Create. Create. Create! 3. What does “karate ni shente nashi” mean? A fundamental precept of Funakoshi’s 20 Principles, it translates as “There’s no first attach in Karate”. This is also can be understood in many ways and I very much like the idea that karate should never be used to initiate any conflict, quote the opposite, deter it before it happens. However, it doesn’t necessarily constrains the karate-ka to anticipate an attack if the situation requires it, thus striking first. 4. What are the three fundamental karate kumite strategies? Go no sen – To defend after the opponent has attacked to completion. Typically, is an uke technology follow by a tori technology. Sen no sen – To defend and counter attack while the opponent is attacking. This requires superb reflexes and explosiveness to get the timing right. Sen sen no sen – To defend by anticipation. Attack just before the opponent has initiate the attacked. 5. What are Mabuni’s “Uke no henka”? To block with such force that if the technique were applied to the trunk of a tree it would lose all of its flowers. A block should be executed so decisively that it not only halts an opponent’s attack but utterly defeats it with a single technique. To flow with your opponents movements, using them against him and as an aid to your defense. Respond to your opponent using fluid movement. Kusshin: (“Darting out and in”) Control of an attack that uses body movement originating in the knees. Keep your spine straight and use your knees to control your height, giving you balance and the strength of your legs so that little effort is required to control the attack. Springing. A reflexive, darting “out and in” kind of body shifting from any angle. Essentially avoiding your opponent’s attack using body movement. Stepping out in all directions. When the need arises, respond to your opponents attacks with decisive, powerful counter-attacks. By utilizing the first four principles you may never need to implement the fifth, but if required you should apply you whole mind and body to the counter. 6. Which major karate style has the most number of katas and why? It’s well known that shito-ryu is the style of karate with the largest number of kate because Mabuni Kenwa studied Naha-te and Shuri-Te arts under Hi-shi-gaonna and Itosu, therefore absorbing all the katas in both systems. There are various branches of shito-ryu with anything from 40 to 60 different forms. 7. What is the relationship between To’on Ryu and Goju-Ryu? 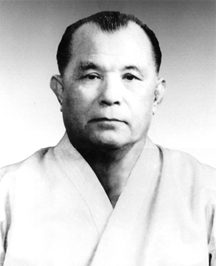 To’on Ryu was founded by Miyagi’s senior peer Juhatsu Kyoda (許田 重発 Kyoda Juhatsu, December 5, 1887–August 31, 1968). 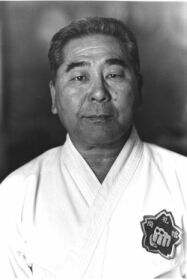 To’on Ryu is a true sister style to goju-ryu karate and in the passing of Miyagi, his students approached Kyoda and asked if he would take the leadership of the Goju-Ryu, which he considered on the condition of changing or adding the name to To’on to the style, which was denied by the students. 8. What other name is Pangai noon known as? 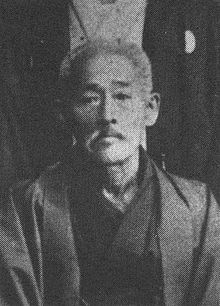 Pangain noon could be translated as “half-hard, half-soft”, the style was renamed Uechi-Ryū after the founder of the style, Kanbun Uechi. 9. What was Shito-Ryu called first and why? 10. Who were the grandparents of Shorin and Shorei Ryu, respectively, and when where they born and deceased? Excellent work Naihanchi shodan drill by sensei Samir Berardo of the Miudokan dojo (www.muidokan.com), featured in global karate blooger Jesse Enkamp’s YouTube channel. The video is an excellent taster of the rich functionality that Naihanchi offers and the explanations offered by Samir are very solid, well structured and executed with a very pedagogic approach. This is a drill I’m determined to learn! Having 90% of us in attendance this evening for our usual Monday’s SKA session afforded the opportunity of an extremely rich and dynamic karate class to unfold. The bi weekly class sizes do vary in number and each time there is a different quality of engagement and dynamic with its own distinctive flavour. We were unable to get into the small studio this evening for a 7.30pm start so we had to wait for our 8.15pm slot in the large mirrored dojo after a Yoga class. I was pleased that Jean – Claud Ruwady’s Yoga class students were starting to exit by 8.17pm. Fernando took us through a brief though intense and varied warm up session from 8.20pm start. By 8.25pm we were listening to those karatekas (who were unable to attend last week Thursday) give their individual reflections and feed back on our recent KJG2 Seminar in Chelmsford, whilst we simultaneously did our own unique body stretches. By 8.30pm Fernando was able to split the class in two, with very different components. Brad led haishu shodan kihon ido with Mark, Damo and Brendon, whilst Matt and Keith led myself and Nick respectively through the first four basic kata uke shodan blocks. Fernando superbly interjected across all the karateka engagements teasing out highlights to polish and adjust our form in the various executions. At the same time Fernando was also addressing and supporting the coaching techniques of those karateka apparent when delivering the form structure content. Matt was able to really drill down on the depth and feeling of the kata uke shodan blocks with me as there was plenty of time within an hour to unpick so much detail, which also allowed Matt to listen very carefully to my responses and then make specific tailor made progression steps for me. Matt reminded me that he had mentioned before the specific power of the uke to feel and visualise each and every time the power of the tori punch. Matt also acknowledged that there will inevitably come a spontaneous and magical moment in my transition of kata performance delivery to display the most intense depth of feeling in kata uke shodan. He then reiterated how your whole body moves forward to control your tori partner after the simultaneous block. Fernando mentioned the conscious mind set slipping into the unconscious mind set during this transition process, pointing out that these first four basic kata uke kihon blocks had an infinite number of layers to dissect and comprehend. Fernando also pointed out how paramount it was to practice the kata uke shodan kihon at ten miles per hour and really understand what the function is at every detail during the movement and transition of same. It is of course important to get the pattern embedded in your muscle memory with the first motion of a block which is always delivered from the leading leg and the punch from the reverse leg, and hence which is then alternated on both right and left legs. The next stage is opposite with the block from the reverse leg and punch delivered from the forward leg, then alternate right and left legs stepping back and forth. I was in my own karate world with Matt for the best part of an hour, which was absolutely fantastic Matt. I said to Fernando and Matt, if only I could do it all over again for another hour and go to the bowels of the karate kihon earth. Alas, it was now 9.30pm and Fernando had asked Mark, an hour prior, to keep a strict clock watch time in order to include the last twenty minutes for Mark’s delivery and coaching on sensei Paul Enfield’s connector drills, as agreed last week Thursday. It was great for me to then be paired up with Brad (and then Brendon) for this connector drill work. Eight of us evenly paired up with Mark coach facilitating here the pedantic attention to detail and seemless transitions of the touch connector flow drills. Kinesthetic sensory acuity is paramount in such exercise. It does take a while to get these connector drills under the skin and feel comfortable in your unconscious mind, allowing your wrist touch action to come to the fore without a hand grab. When we moved on (in the last few minutes of the class duration) to the final part of the third stage of the connector drill work, I found myself briefly paired up with Damo. We were practicing the final push to the shoulder whilst pulling your partner’s arm wrist to off set their balance, and then sliding your right arm under and over to roll round the upper elbow arm of your opponent and push them to the floor with your body weight. Damo mentioned to me that it felt different for him on the three separate executions I delivered upon him. This he thought was a good and pleasing thing as it brought out slightly different but very effective control techniques on my part. My inner thoughts of the richness and depth of tonight’s SKA class were voiced by Keith and Matt, and acknowledged by all others present. Thank you Fernando, Mark, Brad, Damo, Matt, Brendon, Keith, and Nick for a wonderful SKA Monday class session. Have a good Tuesday at work fellow karatekas! Three candidates passed with flying colours their respective grading at our second annual Karate Jutsu Gakkai Gasshuku. Andy has been training for over 4 years and his commitment, discipline and determination has been second to none. Pound for pound, he has been the karateka that has progressed the most in his personal journey. His 2nd level mudansha (blue belt) is more than deserved. 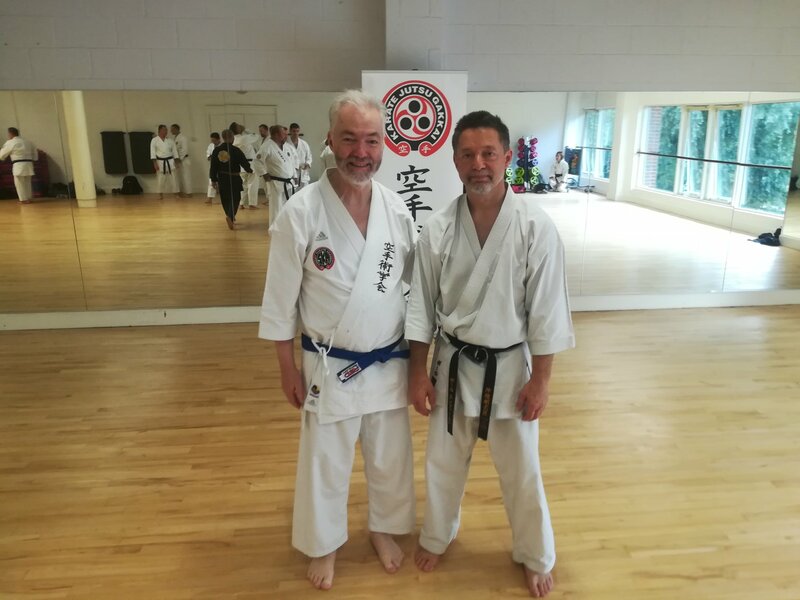 Andy has attended a large number of karate seminars and classes including a seiwakai annual seminar, Iain Abernethy and Andy Kidd workshop, various JJ classes at our sister dojo and friends in Staines, etc. Brendon joined as a 1st level mudansha (brown belt) from his previous goju training in South Africa. Brendon joined SKA over two ago and without ego, has incorporated much of our KJG technology and built on top of his foundations. This has been a tough and demanding training regime at times, resulting on Brendon developing his own karate following KJG fundamentals and core principles and finding a platform to draw it out from within. Brendon’s self-belief and confidence has grown exponentially over the last 6 months and his transformation to becoming a Yudansha is well deserved. Brad has been training continuosly for 8 years. My first and most loyal student and friend, Brad was instrumental to the birth of SKA: first as a single student for the most part of 18 months, he has attended a large number of karate seminars and classes at the OKA, Seiwakai Sunday classes, Seiwakai annual seminars, Koryu Uchinadi gasshuku, Iain Abernethy + Andy Kidd joint workshop, various JJ classes at our sister dojo and friends in Staines and many more. Brad’s commitment to Karate and martial arts is just superb. Brad’s, Brendon’s and Andy’s grading was of the highest standards and I’m just so proud of being part of their journey and witnessed the growth in their karate journey and individual growth. The following extract is the response Hashi McCarthy sent to a fellow martial artist who emailed him. I have highlighted fragments of the text which I found of special interest or, for whatever reason, have resonated in my ears. I have also deleted anything that makes reference to any specific person or association to focus on the educational material encapsulated in this wonderful email. I’ve left the very last paragraph of the original email to highlight his wonderful open-door policy by which Hanshi lives karate (and his life). The lecture you are about to read is master class and this is reproduced with Hanshi McCarthy’s permission. “Greetings from Brisbane, Australia where I hope that my reply finds you well and getting ready to enjoy the Christmas season. It’s always nice to meet a new friend and enjoy some camaraderie with likeminded people on the pathway of the fighting arts. Of course, you couldn’t be more correct in saying that Karate is a system of fighting built upon an incomplete study of Chinese Quanfa … and arguably that which originates in Yongchun. Having been involved with Karate for so many years [I assume Shotokan] I am confident you have must experienced all that which is lacking in the modern Japanese interpretation of the art, and its competitive element, too. In 1985, and after 21 years of studying Karate in my home country of Canada [fyi, I first started in 1964 and later also took up Lam Saiwing-lineaged Hung Gar Kung Fu in 1970 along with Pencak Silat], I walked away disappointed from the modern tradition of Karate, its rule-bound, shallow competitive practices and narrow-minded politics. At that time, I had decided to travel to the source of its origins to discover and better understand the original art. As such, I migrated to Japan and lived there for more than a decade. While living there, however, I discovered that the Japanese art of Karate was based upon an older art developed in Okinawa during its old Ryukyu Kingdom Period. Therefore, I made several trips to Okinawa in an effort to discover the original art. The lengthy study was very interesting and I learned much from the many senior instructors from a wide variety of different styles. Surprisingly, however, and during that mid-1980’s study I also discovered that, “Karate” was actually a hybrid discipline based upon incomplete elements of various foreign fighting practices introduced to the tiny island culture over a long period of time by different people [often identified as, “pioneers”] in a haphazardly [unorganised/unsystematised] manner. As you could imagine, with such an inquisitive personality like mine, I couldn’t let it rest just there and had to continue to pursue the journey. My first trip to China was during the late 1980’s and over the subsequent years I continued to ventured to many places like Taipei, Kuala Lumpur, Hong Kong, Shanghai, Beijing, Shaolin, Guangzhou, Fuzhou, Quanzhou, Changle, Putian and Yongchun etc., for cross-training and related historical studies with many of the leading authorities of the most well-known Chinese fighting arts. During my studies [between North & South, Internal & External, Hard & Soft, etc.] I discovered that the older southern-based Chinese fighting arts [such as Monk Fist, SPM, Crane & Haka boxing, etc.] were actually original sources from which various elements found there way into Okinawan culture. Of course, my early fascination with the studying and translating the Bubishi [武備志/Wubeizhi], and the history of Fang Chiniang, lead me to Yongchun and the Pan family twenty-six years ago in 1990. Since that time, I have long been an admirer of Yongchun Boxing and its wonderful, albeit too often misunderstood, heritage and legacy. 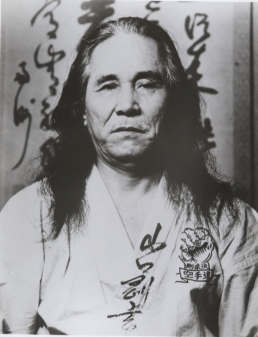 However, because of my own interests, varied background with the fighting arts, obligations and ultimate goals [and knowledge of Chinese/Japanese customs, culture & politics], I never joined Grandmaster Pan’s group, or ever requested becoming “an official member.” To this day, however, I remain a staunch supporter of Yongchun Beihequan, the Wen Gong Ci and everything they represent. Koryu Uchinadi [aka KU] is a modern practice I established about twenty-five years ago. It is based largely my personal study and interpretation of the four principal foreign fighting practices once used during Okinawa’s old Ryukyu Kingdom Period. It is a functional coherent and completely systematised method of self-defense based upon the HAPV-theory and corresponding 2-person drill practices. Individual HAPV are identified, described in detail and studied [so that the learner comes to understand its mechanics, the principles that make it work, why it’s dangerous and how it can be effectively negotiated] before being recreated in Futari-geiko/二人稽古 [i.e. 2-person drills ~ see here tinyurl.com/zymx2f3]. In 2-person drills, the attacker recreates the HAPV, with passive resistance [i.e. learning speed] while the defender rehearses its corresponding defensive theme. The exercise is continued on until the learner gains familiarity with the practice. This is to say that the learner can now progress to the next level after feeling comfortably proficient: If only in the reenactment process. In stage number two, the attacker is required to gradually-to-exponentially increase the intensity of the attack until such time that each engagement is virtually equal to the brutality of a real scenario and any/all glitches in defender’s ability to effectively use the defensive template are resolved. In level number three line-drills [i.e. working back and forth with various other partners; e.g. big, small, young, old, male, female, fast, hard, compliant and non-compliant, etc.] are continually used in subsequent training in order to take the learner outside their normal comfort zone. This is the stage of practice where much discovery is unveiled about, “Murphy’s Law” [Anything that can go wrong, will go wrong], the brutality of physical violence, and the constant variables that surround function and competency. As the learner arrives at a functional understanding the training experience is culminated mnemonically; i.e. saving the defensive theme [for the exampled HAPV] into a solo reenactment practice or ritualized template [Kata/型]. By linking together such ritualized templates into choreographed solo- routines, clearly something greater than the sum total of their individual parts becomes evident … in this light, it is my belief that, “Kata was never meant to teach anything but rather, culminate the lessons already imparted [in 2-person drills].” When the contextual premise is NOT present, or is misunderstood, and/or not supported by functional scenario-based 2-person drills [i.e. the “lost formula”] that Kata becomes something different from what it was originally meant to be. Tegumi [手組] was originally a form of grappling dating back to the time of Tametomo [11th century Japan]. The discipline is believed to have been originally derived from Chinese Wrestling [Jiao Li/角力 from which comes Shuai Jiao/摔角 — new name est. 1928] and evolved into a unique form of wrestling before finally became a rule-bound sport called Ryukyu/Okinawan Sumo. Torite [Chin Na/Qinna/擒拿in Mandarin Chinese] is the Chinese Shaolin-based method of seizing and restraining an opponent. Once vigorously embraced by law enforcement officials, security agencies and correctional officers during Okinawa’s old Ryukyu Kingdom Period, the solo re-enactment of this practice can be found in Kata. Kata [Hsing/Xing 型/形 in Mandarin Chinese], in spite of its vigorous local cultivation during Okinawa’s old Ryukyu Kingdom Period [see my Kumemura theory], are solo fighting routines which trace their origins back to [Fujian] Chinese quanfa [拳法]; e.g. Yongchun Crane Boxing, Monk Fist and Southern Praying Mantis styles, etc. Used as forms of human movement, and unique ways of personal training, they were popularized by the Chinese as ways of promoting physical fitness, mental conditioning and holistic well-being. Ti’gwa [手小] was Okinawa’s plebeian form of percussive impact—–aka “Te,” “Ti,” “Di” [手 meaning hand/s] or Okinawa-te and Uchinadi. It was an art that depended principally upon the use of clenched fists to strike an opponent [in contrast to the open hand method preferred by Chinese arts, according to both Kyan Chotoku & Miyagi Chojun] although the head, feet, shins, elbows and knees were also favoured. I continue to oversee our worldwide movement largely because my elders taught me to appreciate the undeniable pedigree of our pioneers from which comes a deep and strongly rooted tradition that is principally about three key factors; evolution, functionality and preservation. Kata conditions the body, cultivates the mind & nurture the spirit. Finally, I am always interested in pursuing a meaningful relationship with any/all likeminded people and happily leave my door open for you my friend to enter at your convenience. 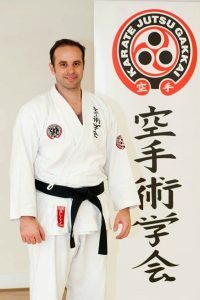 It is with pleasure to share that Matt Bennett has passed his KJG shodan grading after 2 days of training and testing. At KJG we truly grade over a continuous evaluation that last months not a few hours. In line with all karate jutsu traditions, once level of competency has been shown and achieved the new status is recognised, without further ceremony. A test doesn’t make you a black belt, training does. Each grading is unique and each student undertakes their own grading test, unique to their karate journeys, in order to demonstrate the required level of competency. This is a more comprehensive, tough and fair way to assess a student’s karate. We look at the best way to assess standards and that is not by following a prescriptive approach. Matt joined us a a black belt from his previous organisation, less than a year ago, where he trained for many years. Matt was very well schooled and showed very solid basics and understanding of karate when he first joined us. Throughout the year there has been a profound transition in his karate, and the way he has adapted to the karate-jutsu practised at SKA/KJG is remarkable. Matt’s key strengths are a very solid and strong physic, a sound understanding of bio-mechanical principles to both, execute and coach peers; a creative mind to embrace change and fast learning agility. On a personal note, Matt has been and still is extremely humble on his approach to karate. A gentle giant who has met the ‘hulk within‘ and is now allowing to take out for a ride every now and then. Matt is an asset to SKA and the wider KJG organisation and I look forward to many years studying and training karate together.